This simple showcase will give you an example on how to use Title Manager to append custom text to the web site title. It shows an example usage of the "Starting pattern" feature and custom "title item" definition. For the screenshots in this showcase we used a fresh Joomla 1.5 installation. You don't need to have the same. We encourage you to test it with your own web site. Note, however, that it is not recommended to test on a live web site. This article does not contain details on how to use the administrative interface of the component. "How-to" guides are available in the product documentation. Step 1: Titles without Title Manager. First of all, we have to see how the page title is assembled without using Title Manager. The following screenshots are taken with the component disabled, thus, default Joomla titles are seen. To disable the component you must disable the plug-in that handles it from the Joomla administrative interface. Step 2: Define our goal. We need our site to be easily recognized in the user's browser. That is why we decide to put the name of our company(say, Enless Soft) in the title of all pages. We will use the default Joomla titles - we do not change them in any way. We only need to prepend the name of our company. An example of what we want to achieve is shown in the table. For the implementation we will use a feature called 'Default starting pattern'. It allows you to select a title pattern that is to be shown in front of the currently active pattern. - default starting pattern - a pattern that evaluates to the name of our company. The following screenshots are taken after activating the Title Manager component. The title of every page contains "Enless Soft" at the beginning. 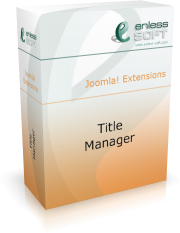 It is possible to further customize parts of your web site to have title different from the Joomla default. Since we set a default starting pattern, we have nothing to worry.